Properties in Bluff Trail average 4.7 out of 5 stars. Property 1: Morro Bay Front Dream ⚓️ Overlooking Morro Bay & Bird Preserve - Pet Ok! Property 5: Studio, 1/2 Block to Harbor and Embarcadero, with small kitchen and Patio. 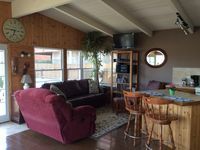 Property 6: Captain Java's Cottage in Morro Bay! Property 8: This Vintage Beach Cottage is located 1/2 block from the Harbor and Embarcadero. Property 9: Just steps away from the Morro Bay Harbor and Embarcadero! Property 10: The Colony Cottage - Rural setting close to town. Property 13: Stay a Half Block From Embarcadero- Walk to The Main Core of Morro Bay! Property 20: Quiet, secluded, tucked away, walk to Bay, downtown and Embarcadero. Property 21: Cheerful Cayucos cottage within easy walking distance to town/beach! Property 31: Bayside Bungalow - 2BR/1BA, sleeps 6, pet-friendly, light & airy bay bungalow. Property 32: "THE ORCHID COTTAGE" PETS OK! Historic Bayfront Cottage In Morro Bay! Pet Friendly! Property 39: Historic Bayfront Cottage In Morro Bay! Pet Friendly! 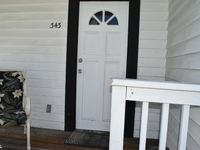 Property 41: Enjoy Downtown SLO: we've eliminated the cleaning fee as well! NEW LISTING! Cozy oceanfront cottage w/ patio & great beach access! Property 42: NEW LISTING! Cozy oceanfront cottage w/ patio & great beach access! Property 43: Captivating Cayucos Charmer-The ultimate beach setting. Come Relax At This 2 Bedroom Spanish Style Home In The Beautiful Shell Beach! Monthly Rental! Property 45: Come Relax At This 2 Bedroom Spanish Style Home In The Beautiful Shell Beach! Monthly Rental! Property 48: Avila Beach Cottage - Just Steps from the Best Beach on the Central Coast! Great little place in the middle of Pismo. No designated parking, but stayed there a week and had no problems finding spots for 2 cars on the street.